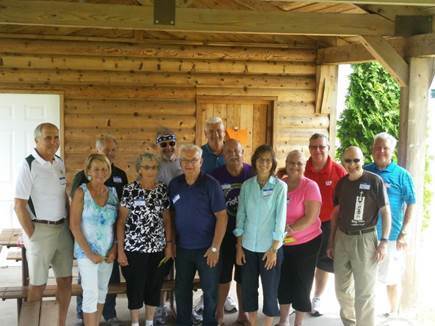 (Left to right, front row) Door-Tran driving volunteers Mike and Sue VanEss, Janet Jandrin, John Kacmarynski, Linda Mohr, Lori Vandertie and Bob Larsen, (back row) Stan Whiteman, Jim Konop, Dan Lindner, Vic Verni, Bob Gamble and Joe McMahon. Submitted. Door-Tran’s volunteer transportation services continue to meet Door County residents’ mobility needs. In 2018, volunteer drivers provided more than 1,400 one-way trips. “We are grateful for the dedicated volunteer drivers who donated 2,555 hours, which is valued at over $31,000,” said Kim Gilson, Door-Tran’s volunteer coordinator. In addition to volunteer transportation services, Door-Tran also provides half-price travel and gas vouchers, repair grants, and vehicle-purchase and repair loans. The half-price travel-voucher program subsidized almost 3,000 trips last year. Door-Tran wasn’t the only transportation service to observe increased need during 2018: the county’s Aging and Disability Resource Center bus and van provided nearly 6,000 rides, and Door 2 Door Rides provided 42,573 rides. For more information on transportation services, call 920.743.9999, visit door-tran.org or follow Door-Tran on Facebook.